АсаламугIалейкум, Budget Magic lovers, it's that time again! 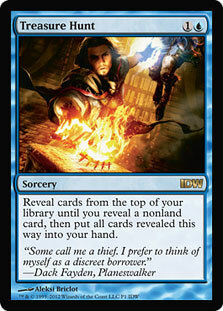 Usually on Budget Magic, we play a deck that I've brewed, at least to some extent. However, every once and a while, a deck that's perfect for the series just happens to fall into our laps, and this is one of those weeks. Last week, a $77 (and 46 tix) deck that's half Zombie Hunt and half Seismic Swans combo managed to come in first place at a TCG Modern States event in the hands of Gracen Atkinson. So, this week, we are heading to Modern to test out the deck. On paper, the deck looks pretty crazy, but how will it work out in practice? We're about to find out! We'll do our normal breakdown of the deck after the videos, but if you want a firsthand look at the creation of the deck, make sure to check out the AMA with the deck's creator over on Reddit. Without further ado, let's get to the gameplay, but first, a quick reminder: if you enjoy the Budget Magic series and the other video content on MTGGoldfish, make sure to subscribe to the MTGGoldfish YouTube Channel to keep up on all of the latest and greatest. I'll be the first to admit that, looking at 42-Land Swan Hunt on paper, I wasn't very confident it would work. The mana base, despite having a massive 42 lands, looked pretty sketchy. Not only do a lot of the duals come into play tapped, but the deck really needs triple red on Turn 3 into double blue on Turn 4, which felt challenging. Plus, as someone who has played a fair share of Zombie Hunt, I was worried that we would spend most games attempting to mulligan into action with a lot of seven-land hands. Turns out that my fears were unfounded. The deck ran much, much better than it looked on paper, and somehow, despite playing all tier decks, we managed to come out of our five-game set with a winning record, at three wins and two losses! When it comes right down to it, 42-Land Swan Hunt is essentially two different combo decks mashed together. First, we have the Seismic Swans combo, which gives the deck a legitimate "I win the game on Turn 4" nut draw. If we can play a Seismic Assault on Turn 3 and follow it up with a Swans of Bryn Argoll on Turn 4, all we need is a single land in our hand (which shouldn't be too challenging, considering we have 42 in the deck) to win the game on the spot. We simply throw our land at the Swans of Bryn Argoll to draw two cards, which should draw us at least one land to throw at our Swans for two more cards. While the numbers in the deck look pretty random, after playing with the deck, it seems that having 42 lands is actually a really good number, because the way we actually win the game with the combo is by "hitting" two lands with the same draw two. Eventually, we have enough "double hits" that we'll have 10 lands in hand (it typically takes us almost our entire deck to reach this point, which is why having so many lands is so important to the deck), and then we switch modes and start throwing lands at our opponent's face rather than at the Swans of Bryn Argoll. The good news is that fizzling is unlikely with 42 lands. We comboed off a bunch of times (it's pretty much the only way the deck wins, at least before sideboarding), and we never fizzled once we had the combo assembled. 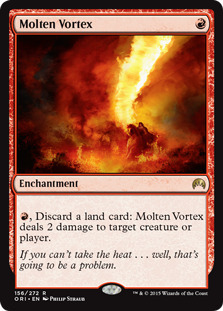 Molten Vortex is sort of a backup Seismic Assault. 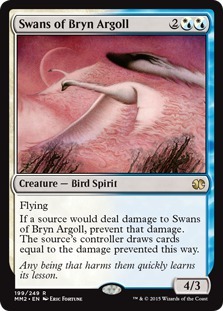 While it isn't as good for actually comboing off (since we need to pay a mana to throw a land at something for two damage), it does get the job done over a few turns and allows us to refill our hand with the help of Swans of Bryn Argoll. It also makes our deck insane against aggro, even without the combo. 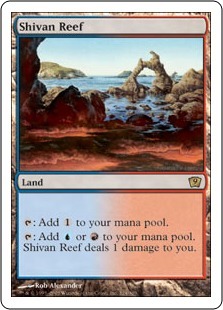 When we played against Merfolk, it felt like we couldn't lose when we played a Molten Vortex on Turn 1. We have so many lands that we simply Shock all of our opponent's creatures (refilling when we draw a Treasure Hunt, if needed) until they run out of action. A long, long time ago at the very beginning of Budget Magic, we played an ultra-budget deck called Zombie Hunt that basically played all lands, four Treasure Hunts, and three Zombie Infestations and hoped to mulligan into a Treasure Hunt, draw a ton of lands, make a ton of zombies, and win the game. The second combo in 42-Land Swan Hunt is similar but with a couple of important differences. Most importantly, we don't have to mulligan until we find a Treasure Hunt with this deck, which makes the deck much less gimmicky and all-in. Second, instead of winning the game with Zombie Infestation, we win the game with Seismic Assault (by drawing a bunch of lands and throwing them at our opponent). The things that makes Treasure Hunt so amazing in our deck is that we actively want lands, since each land we draw is essentially a Shock thanks to Molten Vortex and Seismic Assault. 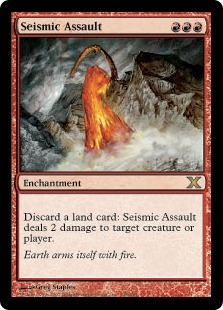 Because of this, even if we only draw three cards with a Treasure Hunt (which is perhaps the bad side of average, considering our deck is 70% lands), we end up with a ton of value, and we occasionally draw five or seven lands, which can essentially win us the game thanks to Seismic Assault. The rest of the deck is a little bit weird. While all of the cards have a purpose, since they are only one-ofs, it's unlikely they will show up when they are needed, even with Treasure Hunt helping us dig through our deck. Since we'll have up to 15 non-lands in our deck when we cast a Treasure Hunt, the odds that we happen to hit the one-of we are looking for is pretty small, as are the odds that we just naturally draw one at the right time. This isn't to say that these cards are wrong in the deck, just that you shouldn't count on them, since you won't be seeing them very often. 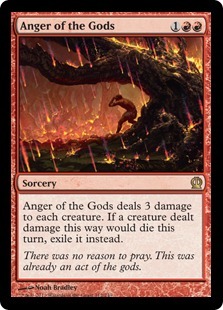 Lightning Bolt and Anger of the Gods give us some removal to help us stabilize against aggressive decks. 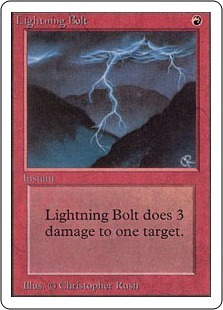 They also work well with Swans of Bryn Argoll, with Lightning Bolt turning into a red Ancestral Recall and Anger of the Gods also drawing us three cards. Having a single copy of Serum Visions is one of the stranger things I've ever seen, but I guess the idea is that it gives us something to do (and helps set up the combo) on Turn 1 or 2 when we happen to draw it. The downside of Serum Visions is that it's usually the worst card to Treasure Hunt into, and I'm not sure that reducing the consistency of our Treasure Hunts is worth the slight upside of having a single Serum Visions in the deck. On the other hand, Day's Undoing can actually be really important for our combo, since it is possible that we run out of cards in our deck. 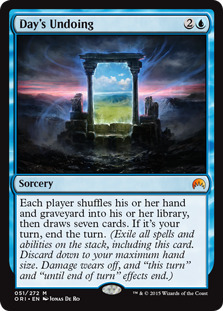 If this happens, we can cast our Day's Undoing to shuffle all of the lands in our graveyard back into our library. Since we can use Seismic Assault and Molten Vortex at instant speed, the downside of Day's Undoing ending our turn is minimized—we can simply stop on our opponent's upkeep and throw all the lands we drew from the Day's Undoing at our opponent's face to finish them off. When it comes to the mana, there are basically two concerns: the number of lands in the deck and the specific lands that are in the deck. As far as the number of lands, 42 seems fine, but you should be warned that the "normal" opening hand with this deck will be two spells and five lands, with four- and six-land openers also being fairly common. This is important because it really changes the way you mulligan. With many decks, you'd immediately mulligan a five- or six-lander, but you really can't with this deck because these are the hands the deck is designed to provide. On the other hand, I think it's possible to cut a few lands (maybe down to 38) and still have the deck function the way it's supposed to (often when sideboarding, I'd just bring in whatever non-lands were good for the matchup and cut somewhere between two and four lands to make room). 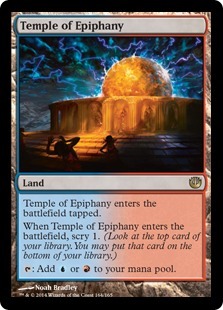 As for the specific lands in the deck, they are fine, although if you have better duals (or even just more duals), feel free to toss them in. 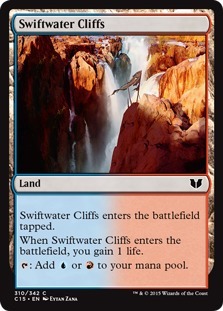 There really isn't a reason the deck needs 27 basic lands, so if you have Steam Vents, Wandering Fumarole, Sulfur Falls, or Spirebluff Canal, they will make the mana better. However, the mana was surprisingly consistent as is. Heading into the matches, I was expecting to have a lot of problems casting our stuff on time (especially Swans of Bryn Argoll on Turn 4), but things ran smoothly in practice. We played "normal" Seismic Swans for Much Abrew a while ago, but this is probably the easiest way to upgrade the deck. While the upgraded version of the deck loses the 42-land gimmick, it replaces these extra lands with good cards like removal and Snapcaster Mage. Basically, 42-Land Swan Hunt is like the combo version of Seismic Swans, while "normal" Seismic Swans is sort of a UR Control build of the deck. While it seems weird to call it an upgrade (because it's almost certainly worse), if you do decide to buy the build from the videos, you can also take Seismic Hunt for a spin. Just take out everything except for the four Treasure Hunts and three Seismic Assaults. Add in some Reliquary Towers so we can cast Treasure Hunt on Turn 2, mulligan until you find a Treasure Hunt, and hopefully win the game on Turn 3! Anyway, that's all for today. As I mentioned before, we went 3-2 with the deck (while playing against all tier Modern decks). All in all, the deck was a ton of fun to play, and none of our matches felt particularly close: we either crushed our opponent with our combo or got crushed by our opponent. There's definitely a lot of variance in this deck: since we have so few non-lands in the deck, something as common as a Thoughtseize on Turn 1 can lead to games where we literally don't cast a single spell. The good news is that there's also a lot of power, and when we find our pieces, the combo is really hard to stop because we can combo off at instant speed in response to a removal spell on our Swans of Bryn Argoll. As always, leave your thoughts, ideas, opinions, and suggestions in the comments, and you can reach me on Twitter@SaffronOlive or at SaffronOlive@MTGGoldfish.com.